Shannon Klotsko, Postdoctoral Researcher at San Diego State University, was one of the science translators featured at the event. 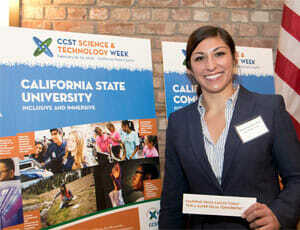 SACRAMENTO, Calif. – Students are the future source of California’s research competitiveness and policy advice – and student scientists from CCST’s Sustaining Institutions were front and center during CCST S&T Week. 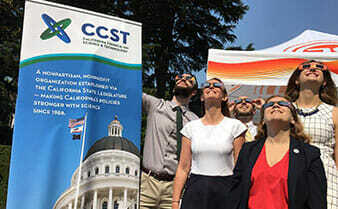 As part of its new “California Science Translators Showcase” program, CCST invited 15 talented graduate students and postdoctoral researchers from UC, Cal State, Caltech, and Stanford campuses to practice a crucial skill: translating science for policymakers. The event format intentionally breaks from academic tradition: instead of presenting large posters or lengthy slideshows packed with dense jargon, these 15 young scientists were simply armed with their flair for conversation and their budding talent for communicating science. 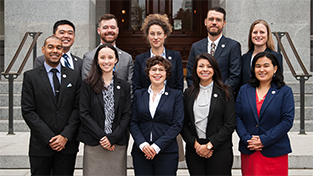 Many in this inaugural class of CCST Science Translators were presenting at the Capitol Building for the first time in their career, and their areas of expertise spanned timely topics such as earthquake safety, wildfire management, water supply and quality, and public health. Candidates had to submit audition videos in which they explained the relevance of their research in less than 60 seconds. The 15 invited presenters then underwent training webinars and other exercises to prepare for the networking event – a key assignment being the creation of an “ad slogan” explaining their research. The February 20th event was organized in partnership with Assemblymember Jose Medina (D-Riverside), Chair of the Assembly Committee on Higher Education. Shortly before the Showcase event, Assemblymember Mark Stone (D-Monterey Bay) and Senator Bob Wieckowski (D-Fremont) made floor remarks in their respective chambers to recognize the 15 CCST Science Translators. 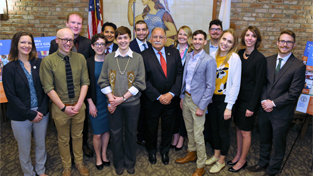 Assemblymember Stone focused his remarks on one of his constituents – participant Sarah Beganskas – who also had a chance to brief Mr. Stone about her doctoral research at UC Santa Cruz in his Capitol office. Senator Wieckowski also made an appearance at the Showcase, along with some 60 members of the Capitol community representing nearly 20 legislative and agency offices and advocacy organizations, as well as regional leaders from the Governor’s GO-Biz iHub program. The CCST Science Translators were perhaps most surprised by the appearance of Caltech Nobel Laureates Kip Thorne and Barry Barish, who toured the showcase as part of their State Capitol visit that day. Both scientists took time to meet and speak with each of the CCST Science Translators. Sarah explained strategies to replenish California’s limited groundwater supplies. Danny explained why “point defect physics” are important for tech development. Kenny explained how we can improve seismic retrofit ratings for buildings. Sonya explained the relationship between adverse childhood experiences and asthma risk, and the importance of clinical prevention. Joe explained how new materials can help harness stormwater for municipal use. Rylie explained innovations in treating dairy manure to meet clean air and water goals. Patricia explained the potential for creating regional markets to expand water supplies in California. Negin explained how extreme weather forecasting can help managers anticipate hydropower reliability. Anne explained strategies for cities to manage damaged buildings and optimize post-earthquake recovery. Shannon explained how she is mapping geologic faults that run through the Sacramento-San Joaquin Delta. Aaron explained how nicotine interacts with human cells, and our understanding of addiction. Gabriel explained how we can eliminate “bad recipes” when analyzing genetic code when prospecting for biomedical cures. Jenn explained why we need to understand the neurobiology of PTSD. Carmen explained current thinking in fire ecology and habitat management for wildfire risk.